Soaring sound or crashing Hindenburg? The new Zeppelin Wireless is a beautiful-looking and beautiful-sounding network music player, bringing back the classic design with an even more powerful, yet detailed, aural experience. The legend has returned. Back in a time when the iPod dock was basically a cheap, plastic charging station with the same acoustic power as dropping your phone into a vending machine cup, the original Bowers and Wilkins Zeppelin arrived bringing HiFi quality to a neglected market. The Zeppelin Air came along a few years later but now, eight years on from its first appearance, the new Zeppelin Wireless is here, rocking the same airship aesthetic as its forebears but bringing an even higher level of audio quality to wireless streaming market. 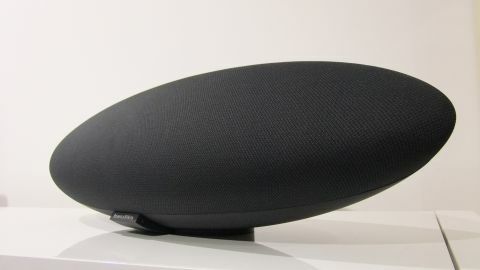 "The important message is this is not a facelift or a slight cosmetic tweak," Bowers and Wilkins' Graeme Taylor explained to us, "this is a ground-up reinvention of the Zeppelin concept." There may be a few of the same screws and maybe some wires that were used in the first Zeppelins, but apart from that this is all new. It's built from the same studio-quality DNA as B&W's flagship 800 Series loudspeakers, even using the same Fixed Suspension Transducer (FST) technology in its mid-range drivers. The goal being to essentially make the Zeppelin invisible from an acoustic standpoint, by holding the speaker cones in a surroundless suspension. This delivers greater control to the sound by ensuring the chassis itself adds nothing to the sound of the driver units. At the very edges of the Zeppelin Wireless shell, either side of the twin 90mm mid-range drivers are a pair of 25mm tweeters, creating delightfully clear treble. And that iconic shape comes into play here with the driver placement. Like the 800 Series speakers, giving their tweeters limited airspace to work with, the iconic elliptical shape does the same for the Zeppelin Wireless' tweeters too. It's not the exact same chassis design as the first Zeppelins though. In some places the enclosure is some 50% thicker, but that's all down to an aeronautical engineering analytical tool - called Fine Element Analysis - which was used to measure the vibration of the internal components. Because of this analysis, and because B&W thought the original design a little bass-heavy at times, the new Zeppelin Wireless has had the twin flow ports removed from the rear of the chassis. This now means the Zeppelin Wireless operates as an almost completely sealed unit, with only a few, smaller micro ports beneath the grill at the front. Does that mean the new design has weaker bass response? Not a jot. There is a huge amount of punch and power to the audio coming out of the Zeppelin Wireless, but that beefy bass is beautifully controlled, terminating precisely without being left to wobble away out into the world. And despite its beefy bass performance its power doesn't impact on the aural clarity of the mid-range experience. Vocals are crisp and clear, and sound natural without being overly harsh. When listening to acoustic tracks you can make out the breath under a singer's voice or the shifting fingers of a guitarist's hands across the strings and fretboard. It also creates an impressively wide soundstage too, despite its relatively diminutive stature. Inevitably though, as a single component device, it's never going to be able to create the same level of stereo as a set of separates. That clear, detailed audio can come from even a relatively low-rent source like Spotify, thanks to its up-sampling through an audiophile-level 192kHz/24bit digital-to-analog converter (DAC). And thankfully B&W has opened up the latest iteration of the iconic Zeppelin to ensure it suits as wide an audience as possible. No longer is it limited to Apple's AirPlay tech, it's also rocking Bluetooth AptX support as well as Spotify Connect. And for the analogue crew there's also an AUX input on the smooth rear of the chassis. Bowers and Wilkins has also made an effort to ensure the Zeppelin Wireless sounds as good at low volumes as high by dropping a new Digital Signal Processor (DSP) into the mix which is twice as powerful as the original design's. And part of this detail at low, as well as high, volumes is the dynamic EQ which monitors the audio signal to ensure its powerful bass remains beautifully controlled no matter what level you turn it up to.